And we're back! Welcome to Season 2 of Connected & Disaffected. After a couple of weeks for scheming and plotting, we're coming back with a bunch of changes. New segments, interviews, deep dives and a lot more. Season 2 kicks off with two new segments. Both try to add context and perspective on horse-race political coverage, which is oddly relaxing. We also have the first installment of an ongoing series on Neoliberalism - a phenomenon that has defined politics for decades which maybe, just maybe is on the way out. We wanted to examine it. Where did it come from? What has it meant for the world? What might come after? To get started on this massive topic, Warren spoke to John Quiggin, a post-Keynesian economist at the University of Queensland. 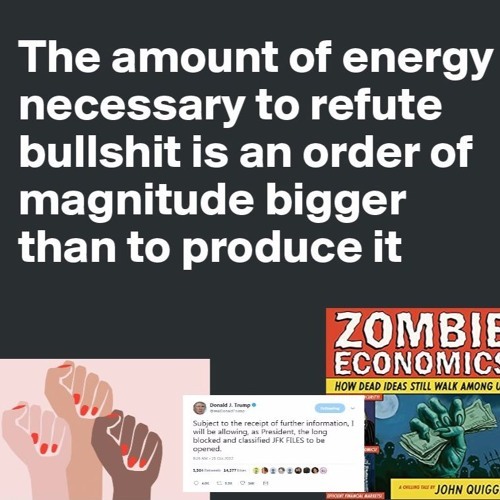 You can find his work all over the place: - He's on Twitter https://twitter.com/JohnQuiggin - He has a blog http://johnquiggin.com/ - He has a book https://www.goodreads.com/book/show/8651441-zombie-economics - He publishes interesting articles in The Guardian... (https://www.theguardian.com/business/2017/oct/09/socialism-with-a-spine-the-only-21st-century-alternative) - ...and Aeon (https://aeon.co/essays/the-time-is-right-to-reclaim-the-utopian-ideas-of-keynes) Check him out! As ever, please share/like/follow/review us: FB: https://www.facebook.com/ Twitter: https://twitter.com/canddpodcast ITunesL https://itunes.apple.com/gb/podcast/connected-disaffected/id1244893114 If you're interested in the future of politics, you're going to like our podcast. JQ: Do Zombie Economics still persist?